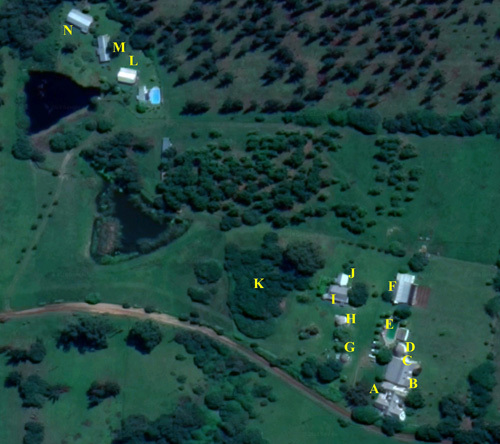 Turn left onto the Uplands dirt road and drive for 1.4kms – Bella Manga is the second property on the right. "Amazing place with really nice owners. Love their farm, with animals, awesome rooms, enjoyable pool. One of the best breakfast I had in SA. We got few nice tips for visit. More than advisable!" "Off the beaten track, just a few kilometres away from the coast of Plettenberg Bay, you will find this estate with wooden cottages tucked away on acres of land where the cows roam free. The perfect break from city living. We enjoyed the rain and sunshine and spent many hours relaxing in the hammock and enjoying our meals on the large wooden deck. We even had a troop of monkeys come to visit. A real country-style atmosphere for anyone needing to rest and recover away from the bustle of everyday life. Only 15 minutes from town, this is a great base to explore the surrounds and still experience the tranquility of farm living. Very much worth every cent. "Personal welcome by paws patrol was only the beginning of our short but very nice experience at Bella Manga. We have enjoyed quiet evening by the pool with good wine and beer that can be bought at the reception. After good sleep, we have been awakened by birds’ singings. Surprisingly delicious breakfast and refreshing swim in the pool right after topped it all. Thank you, highly recommended and will be back once around." "Wonderful hidden-away gem, run by a very friendly couple. Breakfast was absolutely amazing (cooked by Jenny the owner) and great wifi connection. Swimming pool and cows, pigs and chickens! Would highly recommend."